Composed in 1984 (original instrumentation was viola, bassoon and piano), this work harks back to the medieval technique of the hocket (which comes from the Breton word for hiccups). It is a technique in which a melody is broken up into fragments which then roam through all the parts in an open, filigree texture. 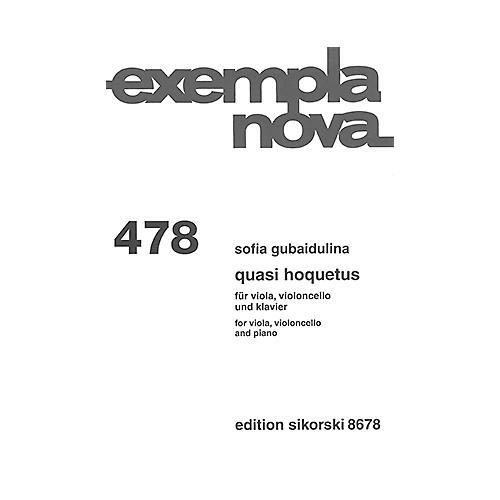 In Gubaidulina's work, however, the hocket embraces not only the melodic parameter, but also and above all the harmony and timbres of her material. The filigree writing consolidates itself gradually into a linear continuum, whereby spiritual symbolism in the form of cross and number figures (e. g. seven and thirteen) takes on a particular importance. The work pledges a certain allegiance to tradition in its distinct formal, harmonic and tonal structure and in its obvious references to Johann Sebastian Bach. However, it is also genuinely and refreshingly innovative, particularly in the treatment of the harmonics in the viola, the multiple stops on the bassoon and the clusters in the piano. Brought to a consummate synthesis in this masterful chamber music work, these two aspects - tradition and innovation - reflect Gubaidulina's uniquely personal relationship to her heritage. My ideal is a relationship to tradition and to new compositional means in which the artist masters all of these means both new and traditional- but does so in a way that makes it seem he is paying no attention to either of them. There are composers who construct their works very consciously; I, however, number myself among those who prefer to 'cultivate' their works. This is why the entire world which I can assimilate constitutes, in a way, the roots ofa tree; its branches and leaves are the works which grow from it. One can call them new, but in the end they are still leaves, and thus they are always traditional, old. (Sofia Gubaidulina) The work is dedicated to Mikhail Tolpygo, Valeri Popov and Alexander Bakhchiyev.